The wonders of beekeeping and helping struggling honeybees are our main motivations for having beehives, but getting honey from our girls is an extra special bonus. We don’t take honey every year. If the bees need it themselves for food we leave it; but some seasons the stars align and there’s extra. 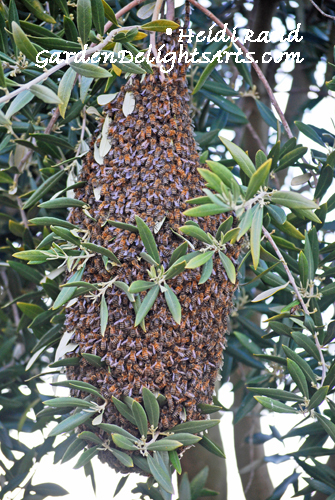 One reason bees can swarm (some of the bees in a hive make a new queen and leave with her for a new home) is because they don’t have enough work to do. In that case, taking honey and leaving them empty comb gives them a reason to stay with the original hive. George is all suited-up and ready to extract. He selects some of the frames that are full of honey and carries them away from the hive. 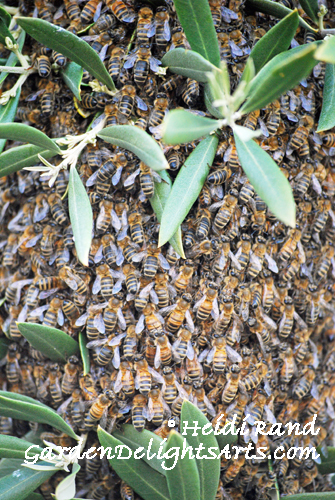 This frame is full of honey – it doesn’t ooze out because once it’s full the bees cap the honey with wax. Scraping the wax off is the first step. You can use a fork, but this nifty uncapping tool is much more efficient and effective. As with everything else related to beekeeping, there are many different ways people extract honey. When we first started we only had a top bar hive, which you can’t use an extractor to get the honey from. George recorded a video showing his ingenious “Salad spinner honey extractor” method. We now have an extractor to use with the frames from our traditional hive, which makes the process much easier. Since it spins the honey out of the comb without crushing the wax, you can put the frames right back into the hive and save the bees the work of reconstruction. After much vigorous spinning, the sweet reward. Well, actually the baklava made by George is the REAL reward! And of course any honey that doesn’t get made into baklava gets bottled. This is the label I designed for our “La Ferme Melliferalle” honey. You can find La Ferme honey – and lots of other delicious local honey – at BioFuel Oasis on 1441 Ashby Ave., Berkeley California. If you’re local you can pick up from us in El Cerrito, email George at elegans@aol.com with your order. 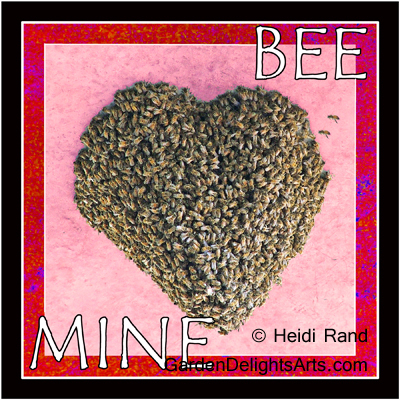 I’ve told you about our friend Joan’s bees. 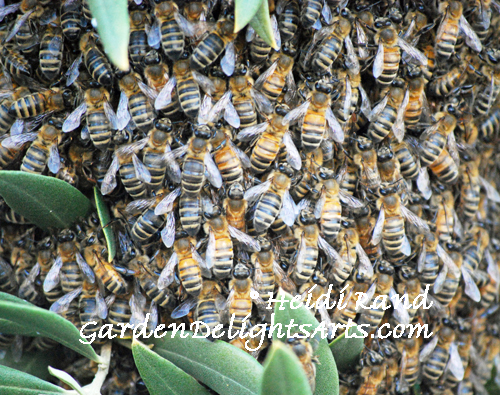 In this post from March, I wrote about an epic swarm that split off from her beehive. Well, sadly, the bees continued to produce more swarms, and finally the hive was so weakened that it failed. George and Joan were debating what to do when things fell into place last week. George’s query to his beekeeper group netted an amazingly generous offer from Bob Ballard to deliver one of his hives to Joan’s house. 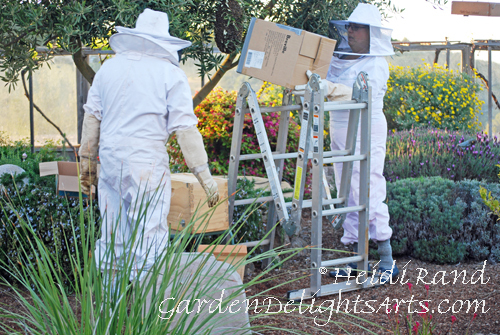 Bob loaded the bees into his truck in Hayward; they arrived in Richmond without mishap. 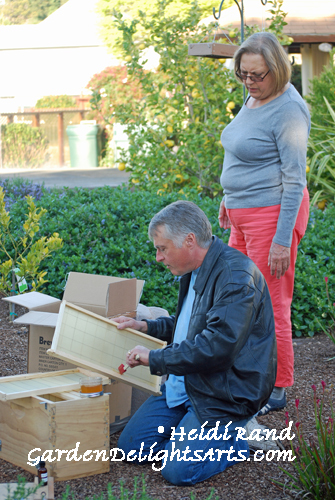 Bob, George and Joan moved the hive into place. Finally it was time to let the bees out! Some ventured about, exploring their new home. Joan’s garden is a paradise of flowers, bushes and trees – like the flowers in the foreground of this photo. I was amazed to see a bee crawl into this beautiful dangling flower. And of course they loved the Salvia. 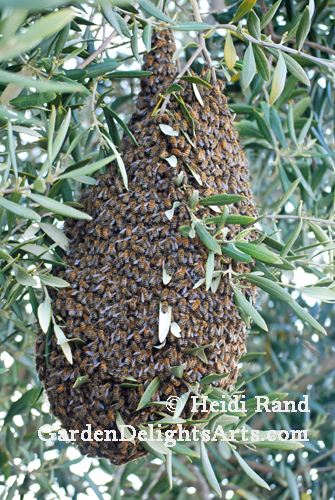 There are techniques you can use to try to minimize swarming, but it seems that the strain of bees we originally gave Joan tend to swarm more than normal. Now that she has a new hive, I think they’ll be happy in her garden for a long long time.